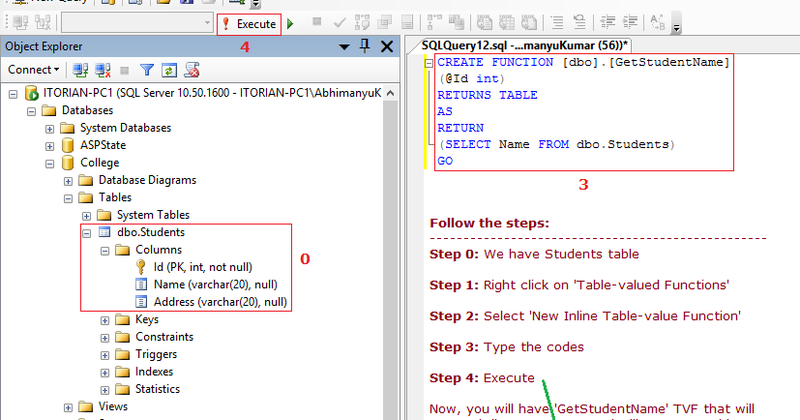 Table-Valued Parameters is a new feature introduced in SQL Server 2008. As the name implies, you can now pass a table type as a parameter to a function or stored procedure. At a high level the TVP allows you to populate a table declared as a T-SQL variable, then pass that table as a parameter to a stored procedure or function. The benefit of the TVP is that you can send multiple rows of data... 1) I misinterpreted your post. You were apparently able to call a function in CR to return a single value from within a SQL Command. To reiterate, you can't use a SQL Function as a datasource. 15/11/2005 · Hello All, I am trying to call a Function in SQL Server which returns a TABLE type. I get an exception Unhandled Exception: System.Data.SqlClient.SqlException: The request for... The question was - "How to Join a Table Valued Function with a Database Table?" This is indeed very interesting as this particular feature was introduced in SQL Server 2008, so what you will see in this blog post applies to every version of SQL Server after SQL Server 2008. SQL SERVER – How to use a temp table in a table-valued function. December 11, 2013 by Muhammad Imran. Local and global temporary tables play a vital role in the SQL Server scripting. We generally use it to store temporary values for further manipulation. But unfortunately, you cannot use it inside the user defined function. PROBLEM : If you use temporary tables in the function, you will get how to connect to aws rds mysql I am trying to tune a query where the same table-valued function (TVF) is called on 20 columns. The first thing I did was convert the scalar function into an inline table-valued function. The definition of table expressions involved in joins must be stable. I.e. They can't be correlated such that the table expression means something different dependant on the value of a row in another table. According to BOL documentation,, TSQL table valued functions materialize the results of calling the function into an intermediate table, whereas CLR table values functions use a streaming model, and therefore the results can be consumed as soon as the first row is returned. I'm using Sql Server 2012 and I have a stored procedure that does about 15 left joins and one of those joins is a CROSS APPLY to a table-valued function.